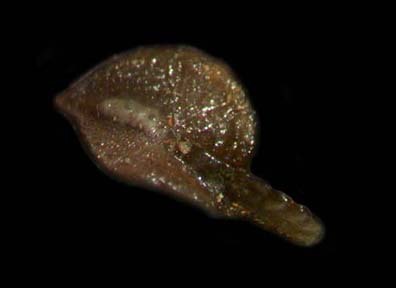 A friend sent me an e-mail the other day with a link to the Indiana9fossils website microfossil section. I looked at those prices and said "YIKES!" 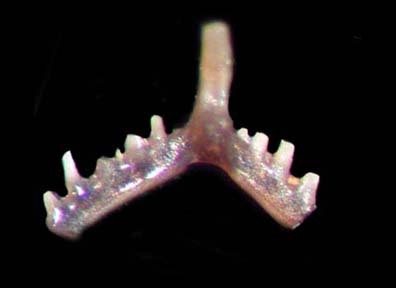 It shows a number of Devonian period condonts from the Vernon Limestone of Indiana. 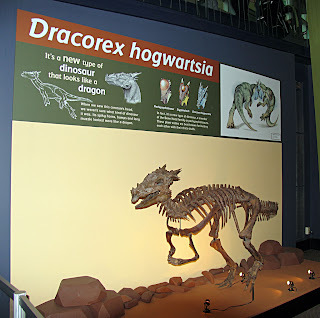 Notice the pictures of the Hibbarella sp and Polygnathus cristatus condonts and the compare them to the pictures on D&D Fossil site in the United Kingdom. 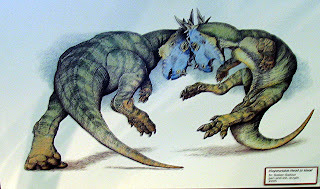 Well I do declare, it looks like the picture labeled Polygnathus from the New Albany Shale is the same. The condont labeled Hibbarella has the same picture as well. Hope everybody is cool with the copyrights on these images since both are commercial ventures. The fossils on the Indiana9fossil site are being sold at $10 a piece while D&D Fossil is selling a capsule to small bag of mixed fossils for $10. So it appears if you want to save money buy the container and use the nice ID card to determine what fossils you have. There appears to be some difference as to what layer these fossils are from while one site says Vernon Limestone and the other New Albany Shale but the file name shows Beechwood. It looks like the ID sheet shows them from either New Albany Shale or Beechwood Limestone. Speed, Indiana is a quarry/concrete plant so it would be interesting who provided this material from the quarry and then who dissolved it in acid to get extract the fossils. I have not e-mailed anyone at either dealer site to ask any questions. This set of fossils origin make for a good mystery. Delve some more into to the microfossil sections of both sites and more overlapping fossils will be found. The net margin is pretty good if a bag yields 10-20 fossils that can be sold for $10 a piece. Of course, they need to be identified, packaged and shipped. 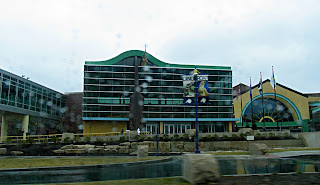 Over the weekend I visited The Children's Museum of Indianapolis which as some impressive technology for their exhibits. Since I was watching my 3 and 4 year old nephews, my study of the exhibits was cursory. It was crowded and a rainy weekend day. 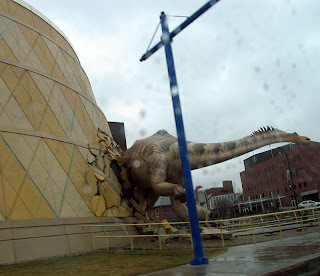 I was impressed with all the people after volunteering in the Louisville Science Center. The facility is very modern and spacious. The dinosaurs appeared to all be casts and computer screens were plentiful. My nephews especially liked the build the dinosaur program. We created several dinosaurs that passed the plausibility test and they walked across the screen into a simulated paleo-environment. There was an interactive dig for uncovering fossils but it was too crowded and my nephews too young to participate. 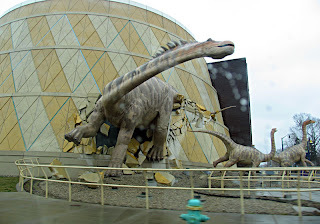 Pictures show the outside of the building with the large dinosaur models either breaking out of or into the museum. 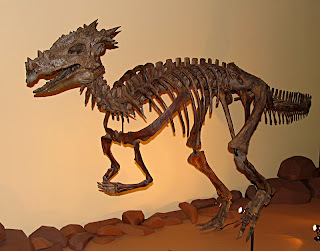 Here is a special dinosaur (Dracorex hogwartsia) that I have written about before. Our local geology club had a cast of it at the last mineral, fossil, gem, and rock show. 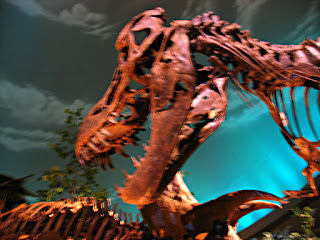 Blurred picture of a T. rex cast part of the main Dinosphere exhibit of the Cretaceous period (65 million years ago). This exhibit includes the Mann Properties Gallery of Dinosaur Imagery (John Lanzendorf Collection, the Paleo Prep Lab, and a Dino Dig area). I briefly saw the train exhibit, the large gift shop, and Star Wars: The Clone Wars exhibit. They also had something to do with Barbie which is interesting since the Indiana State Museum was on to that theme as well. When I get a chance, I will visit there again with more time and attention to study their museum. Great place to take young children!